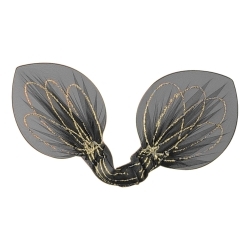 These black chiffon bee wings are perfect for creating bee and other insect costumes or by our directors for the Jitterbugs in “The Wizard of Oz”. Don’t forget a set of our antennas to complete the look! The bee wings have an elastic arm loop so that they can be worn by anyone. The wingspan of these wings is 22” and they measure 7.5” high.